Aqua Wave Top Bags Small 12x11x4"
Buy More Wave Top Retail Plastic Bags Save More! The small Aqua Frosted Wave Top Plastic Bags are sold by the carton and manufactured from 2 mil, 25% recycled HD plastic. They are a part of our Green Way ® Eco-Friendly Packaging and proudly Made in the USA! Useable bag dimensions are 12 x 6.25 x 4". These high quality translucent plastic bags have a wave shaped top with die cut handles and are available in a variety of sizes and colors. 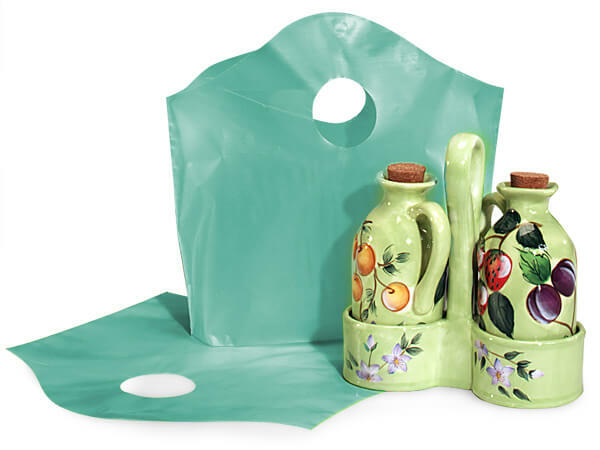 The wave top expands for extra width and the gusset bottom allows this durable plastic bag to stand up like a gift bag! Made in the USA.